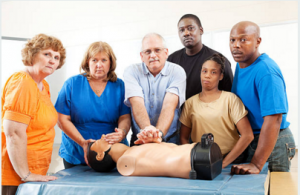 To learn more about CPR training and certification, click here. Cardiopulmonary resuscitation (CPR) is a technique used to save the lives of cardiac arrest victims. Cardiac arrest happens when an individual’s heart stops beating unexpectedly. Without a heartbeat, the heart cannot pump oxygenated blood to the organs and without oxygen from the blood, serious brain damage occurs within four minutes and death occurs within ten minutes. CPR manually pumps blood to the organs when the heart is not able to do so on its own. The basic CPR technique, as recommended by the American Heart Association (AHA), is relatively straightforward and performing CPR on a victim can make the difference between life and death. Rescuers must perform CPR as soon as possible after a cardiac arrest victim collapses to give them the best chance of survival. Place your hands on top of one another, keep the arms straight, and position your body directly above the victim’s chest. 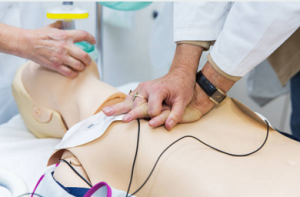 Pump the victim’s chest to perform rapid compressions, at a rate of 2 compressions per second. Ensure that each compression presses a minimum depth of 2 inches into the chest. Continue to perform compressions until emergency support arrives. 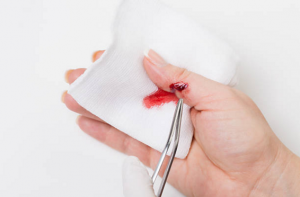 Compressions-only CPR is the most basic technique and is recommended if you are not CPR certified because it is the simplest method to perform while receiving phone instructions from a 911 operator. When you are CPR certified, it is recommended that you perform rescue breathing in cases where the victim is not breathing on their own. To perform rescue breathing, clear the airway by tilting the head back and lifting the chin. Placing your mouth on top of the victim’s mouth, deliver one rescue breath, looking to see if the victim’s chest rises. If it does rise, you may return to performing chest compressions once you confirm that the victim’s breath has returned. If the chest does not rise, give the second breath then resume chest compressions. Use a 30:2 ratio of compressions to breaths until emergency medical support arrives and can take over. Why is CPR Certification Needed? The need for CPR is clear, but you may be wondering if certification is necessary, or if you can simply have a general understanding of the basic techniques. Official training increases your preparedness in an emergency and increases your confidence in your ability to perform CPR. These skills are essential when it comes to taking charge in an emergency and taking action, and that cannot be taught from just reading about CPR. Anyone looking to take a CPR certification class should carefully evaluate the programs that are available to them. While each person will have unique motivation for wanting to take a CPR course, there are several major factors at play that are common for nearly every participant. CPR certification classes should only be taught by reputable instructors or offered from credible organizations. Classes offered through hospitals are a safe bet, but it can be tricky to determine the validity of many other courses, especially online CPR website. Anyone can put up a service for sale on the internet and they aren’t necessarily legitimate CPR or health organizations. Before registering for any online classes or paying for an internet-based class, research who is offering the class, what credentials they have, what organizations, like the AHA, they are associated with, and who writes the actual course materials (physicians or medical personnel vs. writers or marketing staff). Another major factor in deciding which CPR certification program to take is the convenience of the course itself. In-person classes have more potential to be offered at inconvenient times or locations that don’t suit your schedule. Online CPR courses offer the same instruction with the added value of being able to work through the course materials and complete the exam at any time. Cost is another significant factor for many people. If you want to become CPR certified you shouldn’t be held back by cost. There are many classes offered at a range of fees. Free classes are available, often at community centers or public health organizations, however, it’s important to note that these courses are often offered for information only and do not provide official certification. To earn official CPR certification, you must complete the learning portion of a course as well as an official exam. Successfully completing the exam is what will give you the credentials that you’re seeking, whether it’s for personal purposes or required for work. Look for courses that fit within your budget and give you the desired outcome from taking the course. Online classes are an affordable option for many people and it’s worth browsing through several programs find the most competitive rates. When it comes to the three factors that a good CPR certification course should have – credibility, convenience, and an affordable price, USCPROnline checks all the boxes to give participants the experience and the certification they need. When you sign up for a certification course, you want to know that you’re getting the best possible quality instruction and educational material. USCPROnline is different from many of the other CPR certification classes that are available online. Since our central focus is on certifying people across the country in hopes of saving more lives, we are committed to providing the very best material and resources. 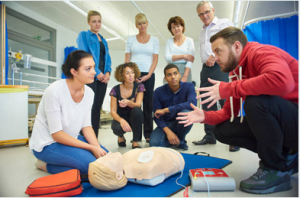 We are proud to offer CPR courses that are created and written by AHA-approved physicians, so you can be sure that you’re getting the same caliber of instruction that health care professionals would receive. In addition, to the quality of instruction, our courses are up to date with all the latest guidelines from the AHA, Emergency Cardiovascular Care (ECC), and the International Committee Responsible for Coordination of all aspects of Cardiopulmonary and Cerebral Resuscitation (ILCOR), and is Occupational Safety and Health Administration (OSHA) compliant. For people who prefer independent learning, those with non-traditional schedules, people who are too busy to attend in-person CPR courses, or those who live in areas far away from where group classes are offered are all individuals that would benefit greatly from an online training course. There are other people who simply prefer to complete their training from the comfort of their home or office, at their own pace. 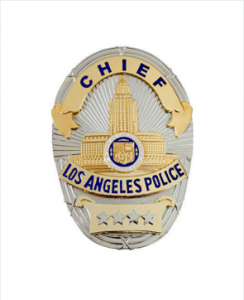 USCPROnline offers a full range of online courses so you can register for the one that best suits your training needs. USCPROnline offers highly competitive pricing on all courses. What this means is that not only are they more affordable, but they are more valuable to you as a participant. Our courses give our participants a better value for your money, allowing you to pay less out of your pocket and receive outstanding value for the money that you do spend. The quality of education you receive, as well as unlimited accessibility at any time, and the reputable nationally-recognized certification that you receive upon completion of the course are well worth the cost of USCRPROnline fairly priced classes. It is evident that CPR certification is an invaluable life skill. The more people who are educated ad prepared to perform CPR, the more favorable outcomes there will be for victims who need lifesaving measures in the event of a cardiac arrest. USCPROnline focuses on delivering the best training possible in a way that’s accessible to as many people, across the country and beyond. Our online model allows you to earn the CPR certification you require in an easy way, without ever compromising quality. Join the ranks of fellow citizens who have completed our courses by visiting https://www.uscpronline.com/ and signing up today. Begin your course immediately and earn your online CPR certification within as little as one hour. Obtaining CPR certification has never been easier or more accessible and the time to prepare yourself for an emergency is now. Education and training are your greatest assets in saving lives, and together with USCPROnline, you can arm yourself with everything you need to know to save a life when it matters most. A team of two patrol officers gave a new life to a 75-year-old woman. They managed to save her life with a timely CPR aid. The woman was on the ground unconscious at Woodland Hills Pizza restaurant. The incident of Bakersfield California in which an 87-year-old woman lost her life due to the refusal of nurse for administering CPR to the victim women. The nurse did so because she followed the protocol of nursing home facility she was employed in. The 87-year-old women lost her pulse before EMS team arrived and was declared dead after she was taken to a local hospital. The dispatcher of EMS team filled a lawsuit against the nurse. This news spread like wildfire in media and was an eye opener for law makers and its enforcement agencies of California. This also raised several questions like what will be the consequences of not helping in emergency situations. or what if you fail while helping. It’s a proven fact now, not only by research studies but also by real life data that people around the victim of sudden cardiac arrest are reluctant to do mouth to mouth breaths. The primary cause for this hesitation is that they are afraid of catching diseases from the victims and even those who are trained fear that they could not perform it correctly. The ratio of casualties collapsed in public due to sudden cardiac arrest is only 1 out of 5 who received CPR from a bystander. The American Heart Association commonly known as AHA is the leading non-profit organization working in the United States to raise public awareness about cardiovascular diseases. 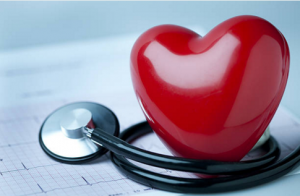 AHA organization also fosters efforts made for the availability of proper cardiac diseases treatments and works for the reduction of resulting disabilities and deaths due to these cardiac, vascular diseases. Arteriosclerosis is the most common disease for aging men and women of today’s urban lifestyle. What is it? Have you heard this before? You certainly know about it by another name but never cared about it. It is the hardness of arteries caused due to the excess of cholesterol plaque in blood. Studies have shown that more than 80 percent of men and 50 percent women having age over 50 are patients of arteriosclerosis.